"Paul's professional manner and experience and has been invaluable to my training and preparation for the London Marathon April 2019. He has provided great ideas and tips for achieving this goal including diet and exercise plans and suggestions for preparation both mentally and physically for this massive challenge. His knowledge and experience of sports nutrition and exercise is very extensive. After each session he has provided written notes on the topics discussed which I have then been able to review when needed. He has offered words of support and encouragement before and after recent races and when I have been feeling a little down and hit a wall when training isn't going to plan. I would not hesitate to give my endorsement to anyone, thinking of taking a similar challenge or making a fitness lifestyle change in their lives, to employ Paul as their personal trainer to achieve theirs goals." May 2018 - Inch and weight loss for Steve and Zoe from Mellor, near Blackburn, in just 21 days this month. ​I whole heartedly endorse Paul's approachability, knowledge and methods. Losing 20 pounds in 8 weeks in a healthy and sensible way speaks for itself. When I started with Paul I was 16 stone 4. After an 8 week period my weight had dropped to 14 stone 12. 'I had experience of other personal trainers prior to meeting Paul. To be honest these experiences had left me pretty cold towards personal trainers. What I found with Paul was a tailored personal service. It wasn't simply about working hard – it was an all-encompassing approach which addressed diet, exercise, sleep and lifestyle. We talked through each in a friendly and sensible way and agreed some goals to work towards. I didn't really appreciate the impact that diet could have and how a sensible diet would make such an immediate impact when combined with the right types of exercise. Paul explained the right combinations of foods in a clear and coherent manner. When I started with Paul I was 16 stone 4. I had a couple of setbacks along the way – although Paul didn't lose his focus or drive, but simply encouraged me to go again. After an 8 week period my weight had dropped to 14 stone 12. I feel much healthier, stronger and fitter, my clothes fit me again and I am enjoying training. I would like to get down to 14 stone 4 – and feel very confident that I can achieve this. "I just thought I would show you some progress pictures." "I was very happy with the results you helped me achieve, which were greater than I anticipated at the start of our sessions. ....Thanks again for your help to date and ... I will certainly be recommending you." Sarah wanted to lose her post birth tummy fat in the spring. By the end of June, Sarah had completed a 8 lb fat loss goal, ready for her holidays. Dave has recovered completely, and now completes 7 mile runs several times a week. Lynne and Kelly have both lost 8lb in a short, 23-day period, taking them into Christmas slimmer and more toned. They have succeeded by working out together - with trainer, Paul - and they have adjusted their eating accordingly. Well done ladies. Miss Jenny B. started in November and, unbelievable as it might sound, after only one workout and consultation she had already reduced her weight by 5lb. By the end of February Jenny B. has lost 19 pounds in weight More success here. Mr. Warren M, a businessman, started a weight and energy management plan in September. 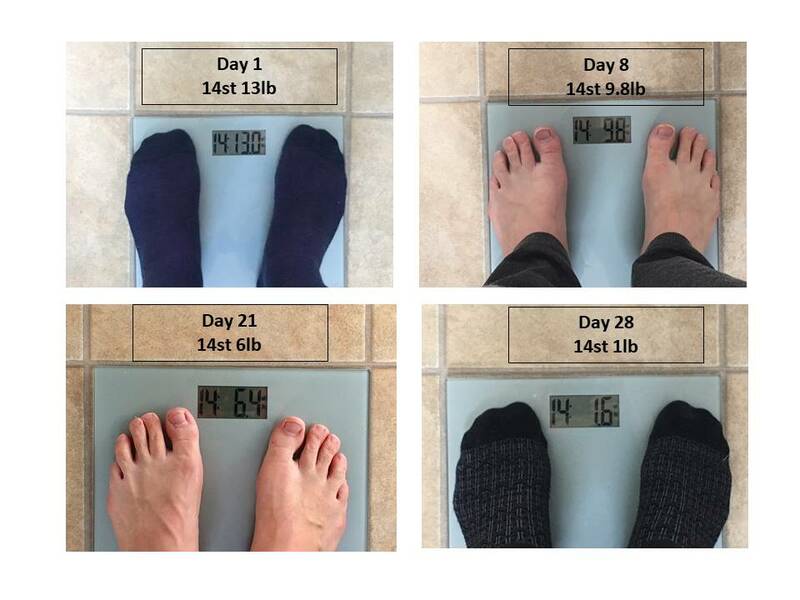 "In 7 weeks I have lost 21 pounds of bodyfat!" After many years of trying, gym based training had not worked and I was unable to control fitness and weight. I needed something of a new approach, to work within my time scales and diary, in order to achieve benefits. I found the PWR website online and Paul visited my home for a free initial chat, shortly afterwards. I expected more of a regime styled training approach. Instead I have found that we have taken more of a balanced view on diet and exercise, which is much more interesting, and better. To date (approx 7 weeks) I have developed a better approach to diet, exercise and - reduced stress levels. I have stopped drinking caffeine and alcohol, and have seen stress and weight benefits due to both. Also down to the exercises which are varied and interesting. I would definitely recommend Paul (from PWR) to others." "Thank you for all your help during the months before I climbed Kilimanjaro. I have no doubt in my mind, whatsoever, that without the gym time I spent with you, I would not have made it to the summit. It would have been 7 out of 32! Over the months you have, not only, prepared me physically, something I would never have done on my own, but you built up my mental strength, and that is what I needed most on the final summit night. So all those days when I have wanted to give up and tell you to **** off and you pushed me, that is what I feel got me there. I could never have imagined how tough it was, I had everyone telling me that I was training too hard and maybe I should take it easy for a while but I am glad we carried on. THANK YOU Paul for everything, I really do mean it when I say that without you I would not have made it"
UPDATE: Tony Roe has been training with Paul for 4 years. He had to overcome a number of barriers to develop healthy habits and start to lose weight. Having started at well over 18 stone in weight, Tony measures, in August, at 15 stones and 7 pounds. A total fat loss of at least 40lb or 20kg. Thank you very much for the really helpful training review and advice. It certainly reinforces some key areas that I was previously unaware of. I really enjoyed the session yesterday and I can feel the effects of it now. I will definitely recommend you to anyone who expresses an interest in getting fitter and healthier. Tony Roe of Fulwood has made staggering progress since January 13 this year. Tony has removed an incredible 28 pounds of body fat from his body in 5 months. In difficult circumstances, we put together a plan of healthy eating and regular swimming. Tony now swims 1km several times a week. Duncan reduced body fat percentage from 25% to 18% over the space of 6 months. such as the Chester Half Marathon in May. both having been non-runners 12 months previous. Its all about YOUR GOALS. When you enrol (click here) you will receive a questionnaire in which you can tell us your dream goals. We will give you an honest and fair guide to how you can achieve it. Alongside your training regime, you will receive top tips on controlling food, and dozens of super hot tips on how to permanently avoid the traditional mistakes we make in trying to lose fat. We want you to stay with us in the long term, but we aim to educate you so that the results you see are long lasting, independently sustainable and part of your ongoing lifestyle.